Hawking cheap products on TV commercials suits Casey Clemens, because it's easy and it pays well. Telling lies is second nature to Casey, whether to strangers on national television or to her mother on the phone. Casey's got a decent condo, a cleaning lady, and a rich boyfriend (never mind that he's married). If Casey feels dissatisfied, all she has to do is fantasize about her hero, King Arthur. It feels like an acting career, sort of, until the day before Casey's 40th birthday, when she loses everything she never cared about, falls through a gap in time, and accidentally saves the real King Arthur's life. The king has enemies, war encroaches, and an actress with an honesty problem has no place in a war camp. Not if she wants to make it back to the 21st century alive. Not that she could go back if she wanted to. Not that she wants to. I read a contemporary short story by Ms Burchard recently and admired the sharp, witty prose, so I was expecting something similar from Camelot and Vine, but with an historical twist. The opening delivered as expected with a sharply written cameo of a woman who has been let down by life and her family, but manages to retain a positive spin and makes jokes to keep her spirits up. 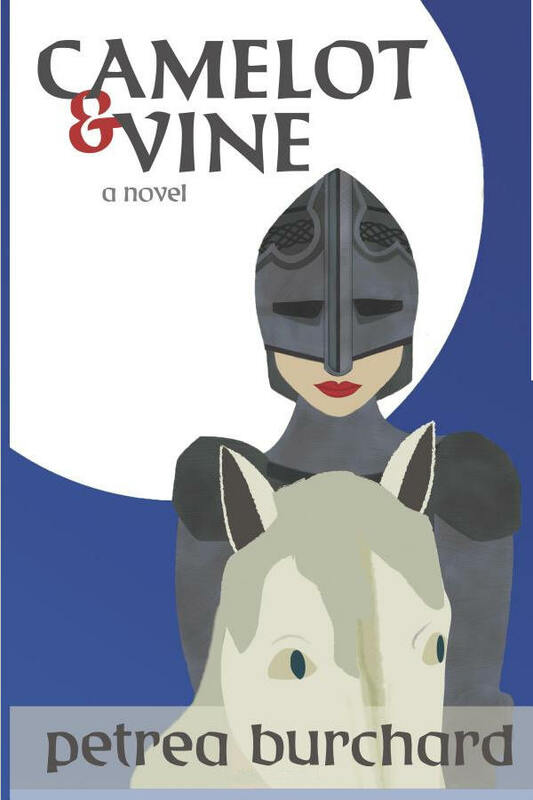 Then the heroine, Casey, finds herself inexplicably in King Arthur’s England, somewhere near Salisbury Plain fifteen hundred years in the past. No Disneyish fantasyland this where maidens wander round stone castles in wimples and the men kiss their hands at every opportunity, but a primitive, harsh world where men have to fight for what they have and then fight again to keep it. Where the middle-aged King Arthur isn’t the blond, youthful guy of the TV series, but a middle-aged, rough and ready character with an eye for treachery who warns Casey in no uncertain terms that she is a wizard sent to ‘save’ him from his enemies, and if she ceases to be of use to him - she’s dead! Casey has to struggle with being a chained prisoner with no flushing loo, mirror or proper washing facilities, becoming a privileged visitor suffering the envy of those around her, together with all the disadvantages of being a woman in a tribal society where outsiders are treated with hostility. The historical background, where the characters and stories of Arthur’s knights are distorted but still recognisable, is truly excellent and I enjoyed unravelling the legends from a credible historical society - had it ever existed. There are some hilarious parts too, for instance, when Casey explains she got her ‘gossamer chain mail’ at The Gap, which she hurriedly changes to ‘gap in time’ and whenever a character asks her ‘did that come from the gap too’, I couldn’t help a chuckle. This is a beautifully written story that flows perfectly, and I found it hard to believe it is a debut novel. The fantasy aspect is tempered by Ms Burchard’s emotive writing as Casey spends her solitary hours coming to terms with her dysfunctional family and her own unsatisfactory life, and learns not to judge others by modern day standards. The author also uses her experiences as a former actress in the narrative which gives a unique and fascinating perspective to the way she describes things. Thoroughly recommended - and I also have a guest post from Petrea on The Disorganised Author Blog for Easter too.